A company which has bought the failed South West Film Studios in Cornwall has told BBC News it plans to reopen the location as movie studios. New owner St Agnes Properties insisted it was not looking for grants, but admitted it asked the government about the possibility of public funding. 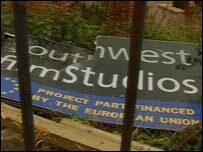 The studios at St Agnes had nearly £2m of European Union funding before they went into liquidation in 2004. Their demise was Objective One's highest-profile failure in Cornwall. The studio development has been sold by the mortgage company to the Gloucestershire-based property company St Agnes Properties. A company director, Marilyn Gough, told BBC News they wanted to make a success of the studios and were looking to appoint a team of film industry professionals to run them. Preliminary talks about grant aid were held. Government Office South West confirmed that, and said: "We will proceed with caution". Marilyn Gough added that the company has decided to press forward as quickly as possible without seeking grant assistance. 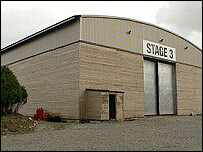 The closure of the £5.7m, half-built studios was the European Union's Objective One grant programme's most high-profile embarrassment in Cornwall.